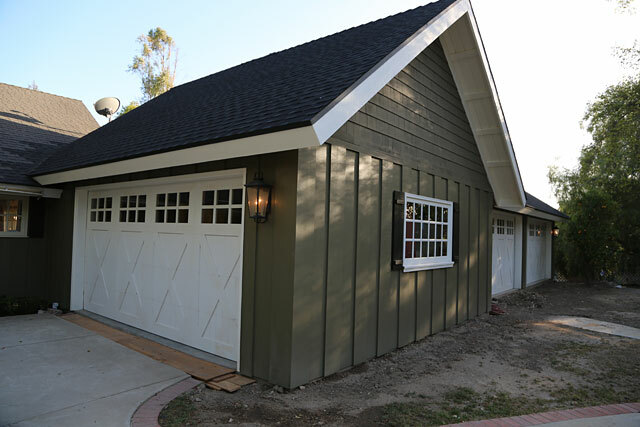 The only thing keeping the garage from being anything but a glorified carport was a lack of doors. 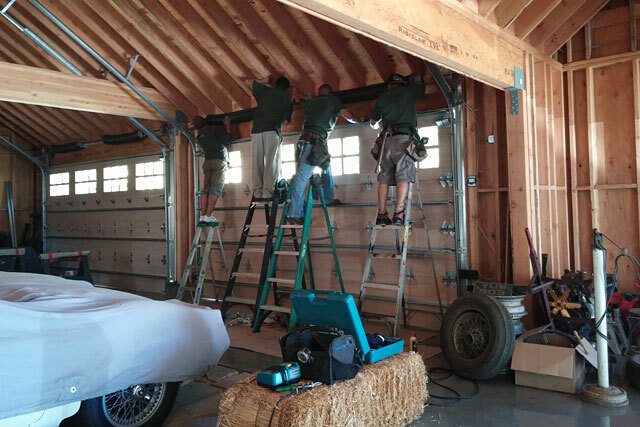 It took a while to get them installed but finally we would have a sealed, secure structure. I know my amazingly patient wife was at least as anxious as I was, because there was still a large tool box in our living room! It was also time to do something about the remaining cars in the driveway, so the lifts were brought out of storage and readied for re-assembly. This was the point where we felt like the project might actually have an end in sight. It was still beyond the horizon, but it was there! We had quite a few problems with the door company. Delay after delay, broken promises and many wasted trips were made until the doors were finally fitted. Unfortunately they were nearly 2-inches smaller than the openings and didn’t even work properly. They tried to weasel their way out of it until finally we had to threaten a law suit at which point they made new doors. It still took months before everything was working properly. 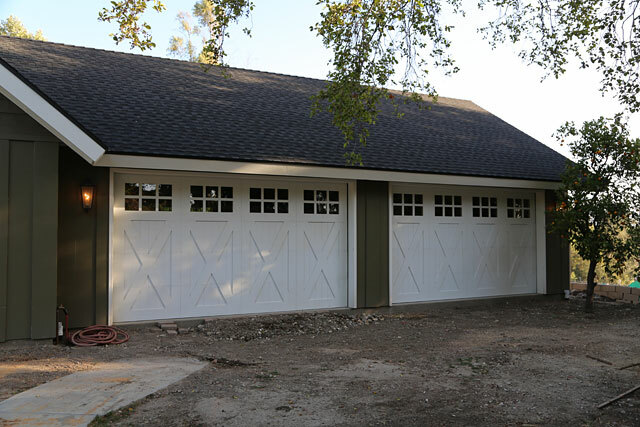 The large back doors were ordered from someone else. 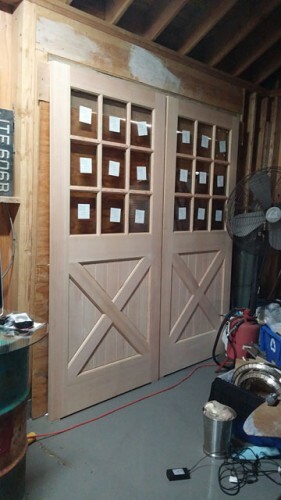 The doors begin to go up, on panel at a time. We decided to splurge on solid wood doors for their insulating properties against not only temperature, but sound. Happy neighbors are a good thing. 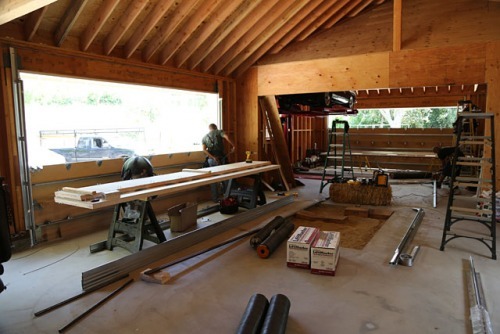 Most of the work was done from inside. These are heavy panels, so four workers were on hand to lift everything into place. As in our previous garage, the door tracks are set up to follow the roof line in order to clear the lifts. 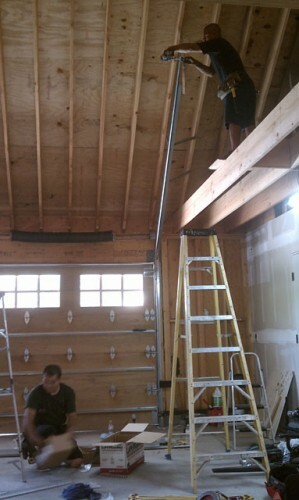 But this garage is even taller than the last one, so extra tall ladders are required. 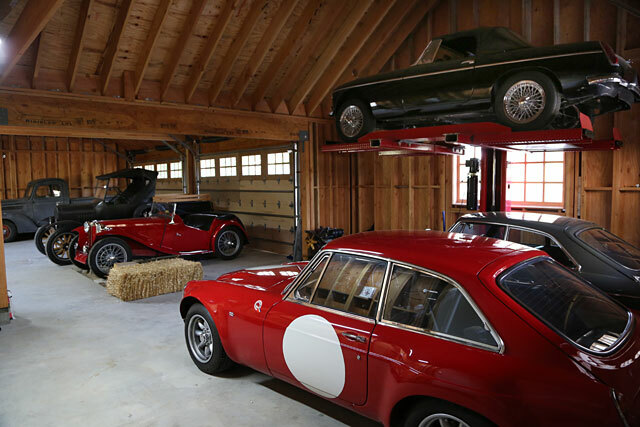 In this case, the still incomplete storage loft is put to its first use. Due to the heavy doors and steep track pitch, very large springs are brought in to handle the load. They are so heavy that it takes four guys to lift them into place. Too bad this isn’t video so you could hear the groaning as they climbed the ladders one step at a time. 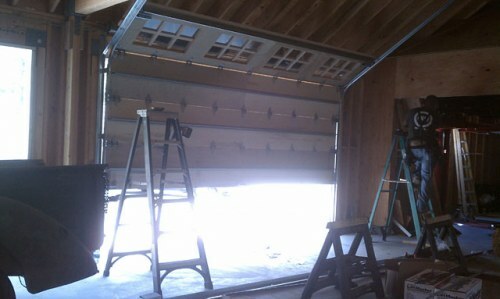 One door is complete and rolling up and down. Exciting! 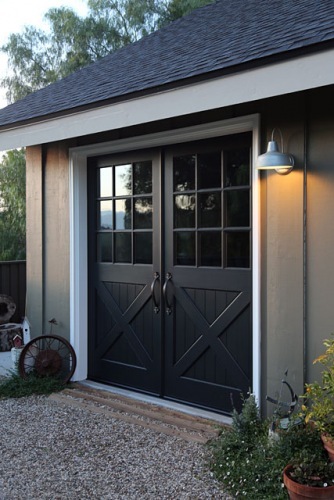 And there it is, we finally have doors. Congratulations, it’s a garage! 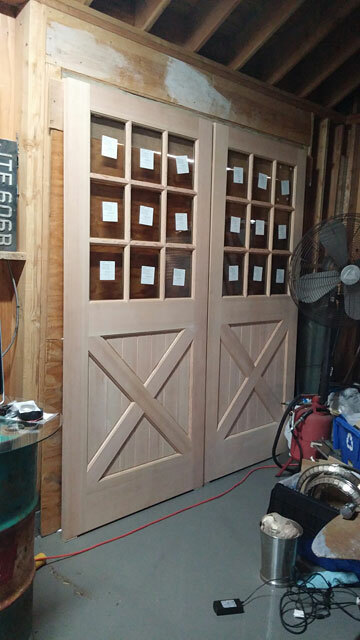 The two smaller doors installed and primed. A concrete sealer is laid down in the lift depressions before the base is bolted in, because once it’s in that part of the floor will never be accessible again. The rest of the floor will be coated later. Here, one of the lift masts is being hoisted up. This is as far as it goes without human power. I won’t bother posting a bunch of photos showing how the lifts go together because we already covered that in the last project. If you want to see the details about how the lifts assemble and operate, visit Garage Project 1, Part 9. 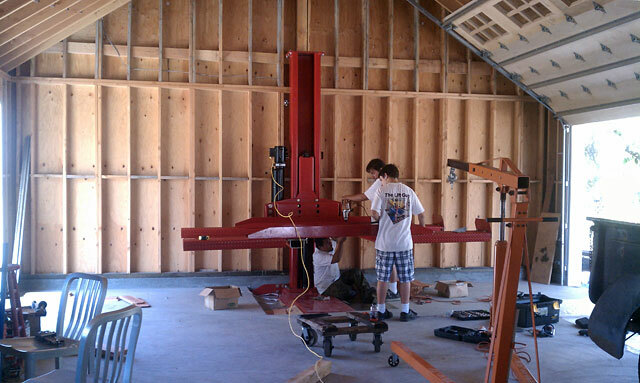 The first lift is complete and the MGB is in the air. Now we’re getting somewhere! 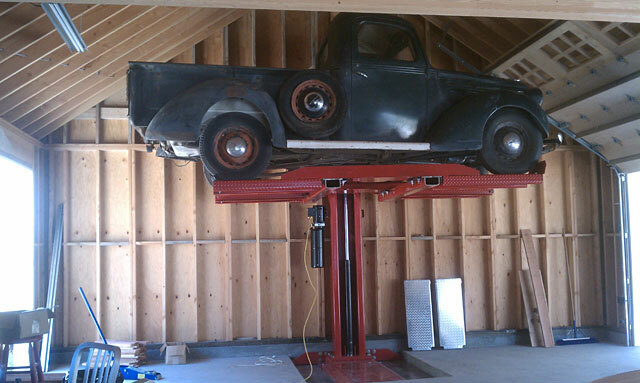 The second lift is completed and the ’39 Ford is now up in the air, awaiting free time to finish it up. It may be waiting for a while. 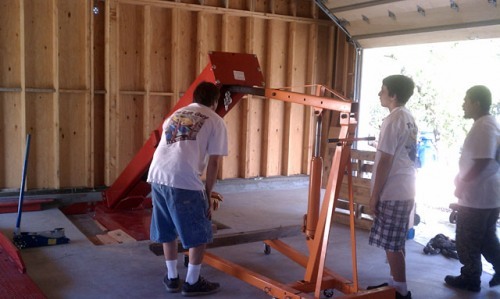 These ramps also proved much too small, so larger ramps were purchased and installed at a later time. One truck on top of another. There’s something you don’t see every day. The hole for the work hoist will remain a hole until a much later date, so for now we re-purposed some broken concrete to give a level surface to drive over. Cars begin rolling in along with a bunch of “garage stuff”. Finally, I have a work space with tools in it. The floor has to be protected from oil drips but otherwise we have officially re-joined the ranks of those who own actual garages. And there it is. For the first time in my life, everything I own is indoors! What an amazing feeling it was to reach this stage. And for the first time since the day we moved in together many years ago, the wife has a parking space inside the garage! You don’t often see a woman so excited to pull a car into a garage. This is the “daily driver section”. More happy cars, cleaned up after a year of roughing it. The last of the doors finally arrive. 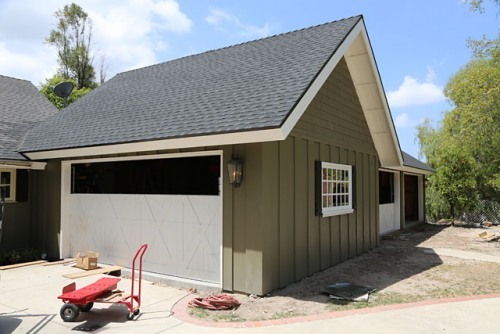 And a year later they finally go up and complete the weatherproofing of the garage. As we are now looking a year farther down the road from the rest of this page, you get a sneak peak of the landscaping work to be covered later.